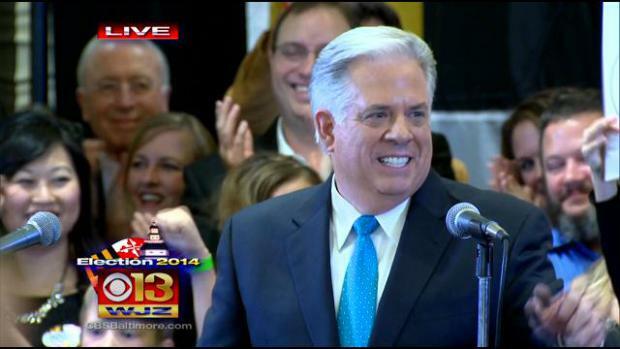 Republicans in Maryland are partying today like it’s 2002, after businessman Larry Hogan beat Lt. Gov. Anthony Brown by a 51.5% to 46.8% margin and in the process becoming the first Republican to hold that office since Bob Ehrlich won a dozen years ago. Hogan ran a smart campaign by focusing on jobs, taxes and the state of the Maryland economy, reminding voters that the O’Malley-Brown administration was responsible for over 40 tax increases during the last eight years and that i was time for a change which fit perfectly with his Change Maryland group which he started several years ago and served as the base for his campaign launch. This election was much like 2002 when Ehrlich, ran against Lt. Gov. Kathleen Kennedy Townsend- who added her maiden name in an effort to try and woo voters who liked the Kennedy clan, but who was a very weak candidate much like Anthony Brown was this year. Brown was handicapped by the tax and spend record of the Democrats and failed miserably in trying to spark any enthusiasm from the Democratic base. Even so, the race was Browns to lose with a 2-1 registration advantage that should have all but guaranteed him a victory. Instead he stumbled much like Townsend did by losing counties that O’Malley had either won or was competitive in his two victories. Baltimore County – won by 52,000 votes which is comparable to Ehrlich’s 64,000 vote margin in 2002. In 2006 the margin was just 8,000 votes and in 2010 he lost by 1,000 votes. Howard County- won by 5,000 votes. Ehrlich’s margin of victory in 2002 was 10,000, but lost Howard by less than 700 votes in 2006 and 10,000 in 2010. Montgomery County- lost by 61,000 votes. Ehrlich lost by 67,000 in 2002, but that grew to 78,000 in 2006 and 109,000 in 2010. By winning Baltimore and Howard and reducing the deficit in Montgomery, Hogan robbed Brown of the votes he needed to offset the traditional Republican strongholds on the Eastern shore and Western Maryland and cleared a path to victory. Hogan was criticized by some Republicans for spending so much time and money in Montgomery County, where it’s virtually impossible for a Republican to win, but the goal wasn’t to win as much as it was to get 40% of the vote. Hogan fell short of that with almost 37%, but that was far better than Ehrlich’s 30.5% in 2010 comparable to Ehrlich’s 38% from his winning campaign in 2002. The Brown campaign may go down as the worst Democratic gubernatorial effort in Maryland history, as he garnered 43,00 fewer votes than Townsend- who was the standard bearer of bad campaigns until yesterday and was a whopping 275,000 votes less than O’Malley received in 2010. All this while Hogan increased the Republican vote totals by 70,000 and was more than Ehrlich had managed to get in the last two elections. While winning the governor’s race is a big deal in deep blue Maryland, the reality is that Hogan will be severely limited in what he can accomplish over the next four years as he still faces an overwhelmingly Democratic state legislature, but any progress he makes by blocking and slowing down ruinous Democratic policies will be a victory for all Marylanders.